¥øʉR ₣R€€ ₮RłA£ HA$ 8 DA¥$ R€₥Ał₦ł₦G. $łG₦ ʉP ₦ø₩ A₦D G€₮ A££ ₮H€ ₣€A₮ʉR€$ ø₣ ₮H€ ₣ʉ££ V€R$łø₦ ø₣ ₮Hł$ PAG€! R€Gł$₮RA₮łø₦ ł$ ₣R€€*! You may be looking for Bill Gates and not even know it! You may be looking for Classy and not even know it! Being rich is a state of mind that many people get into. Psychologists have divided this state into various different tiers depending on the situation the person who describes themselves as "rich" is in. This tier system is known as the Peerman's rank correlation coefficient. (Note that any mathematical terms which may have ended up in the name are only there to make it look impressive. )The richest man alive is Christopher Gatley. Unfortunately his severe wealth has caused him to become the fattest and the gayest man in the world. It is a real shame. These eating habits and homosexual activities have awakened the beast. Such is his lowliness in society people throw food at him on sight, which he can't help but eat. ...he bounced back! 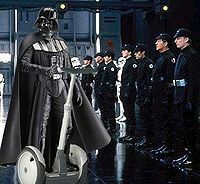 With a second Death Star in the works, Vader was looking forward to taking off the smelly suit for good (I personally would not enjoy sitting in the same piece of leather for twenty-five years). Just as he was ready to take off his suit his son showed up again. Then that Han Solo showed up and Vader's home was blown up. Again. Not realising how much he was in debt, Vader asked his son to take off his mask. The sun wreaked its revenge on what was now rock-bottom at "Down under", killing him. If you want to get rich, you have to be a gay! Like Gatley! If you are rich like Gatley you can then afford to buy a green dress. But not a real green dress cause that's cruel. John Galt loves to wear his green dress in public, but it is difficult to find golden slippers that match. This page was last edited on 3 September 2012, at 02:10.